Does Sheldon Cooper still make the grade during the second season of the Young Sheldon TV show on CBS? As we all know, the Nielsen ratings typically play a big role in determining whether a TV show like Young Sheldon is cancelled or renewed for a season three. Unfortunately, most of us do not live in Nielsen households. Because many viewers feel frustration when their viewing habits and opinions aren’t considered, we’d like to offer you the chance to rate all the season two episodes ofYoung Sheldon for us here. *Status update below. A CBS sitcom, Young Sheldon stars Iain Armitage, Zoe Perry, Lance Barber, Annie Potts, Montana Jordan, and Raegan Revord, with Jim Parsons narrating. Season two of The Big Bang Theory prequel unfolds in 1990 and centers on Sheldon Cooper (Armitage), as a 10-year-old boy. Surviving childhood in an East Texas outpost — one dedicated to all things faith and football — is no mean feat for this unique genius and his otherwise ordinary family. What do you think? 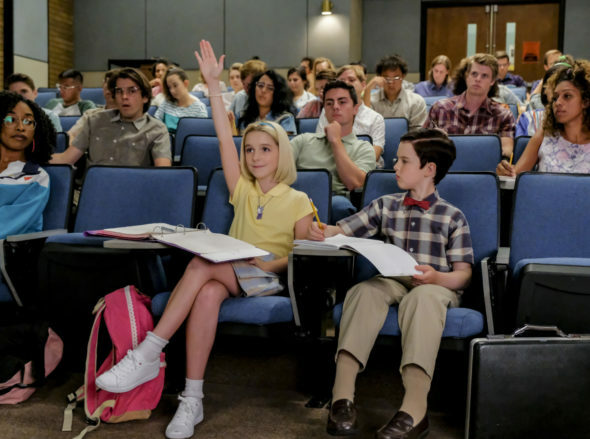 Which season one episodes of Young Sheldon TV series do you rate as wonderful, terrible, or somewhere between? Should CBS cancel or renew Young Sheldon for a third season? Don’t forget to vote, and share your thoughts, below. *2/22/19 update: CBS has renewed Young Sheldon for seasons three and four. More about: Young Sheldon, Young Sheldon: canceled or renewed? I love this show. Please renew! I love all the characters this is an excellent family show please renew for another season. This show has been awesome!!!!! I love learning the correlation between young and adult Sheldon. I heard Big bang was going to be ending. I’m glad we’ll still have young Sheldon to enjoy! keep sheldon!!! one of the better shows on tv. could watch him an hour!!! please renew!!! We adore this show! It is so funny and explains a lot about the grown Sheldon. I like the pick for his mom too!. I like all the characters and it is good to see Annie Potts again. I always did like her in Designing Women! She has a great sense of humor! Please renew this show! Having watched BBT for the entire run of the show, Young Sheldon gives the BBT views the back end of Sheldon’s childhood and how he evolved to the gorgy genius he portrays on BBT. The acting of Young Sheldon is fantastic!!! I’m really disappointed with season 2. Episode 4 is the absolute worst. Mary once again being a shrew. Hands on hips nasty look on he face. If the show doesn’t improve next week, I’m finished. I enjoyed watching a crisis of faith and octopus aliens. I liked the fact that they showed Mary as being human and that she was struggling with her faith. There will be doubts when it comes to believing in God. But in the end it boils down to Faith do you or do you not believe in him? Society today is doing everything it can to erase God from this earth. We all need him, whether we like it or not. Dawn I totally agree with you. Of course each Young Sheldon will be different. But they all touch on our lives one way or the other. To me it’s like going back in time, when that’s how people actually lived. But it’s such a good show, Do not let this one go for a long time! Sometimes sad, but this also really funny. I agree with you both. Please stop removing God from every show. Or making a mockery of him. TV is vast enough to give all something they can get behind. I’m so tired of most all shows being of the same like mindedness. It becomes old hat and is also disrespectful of so many of the viewers! Please keep more coming!